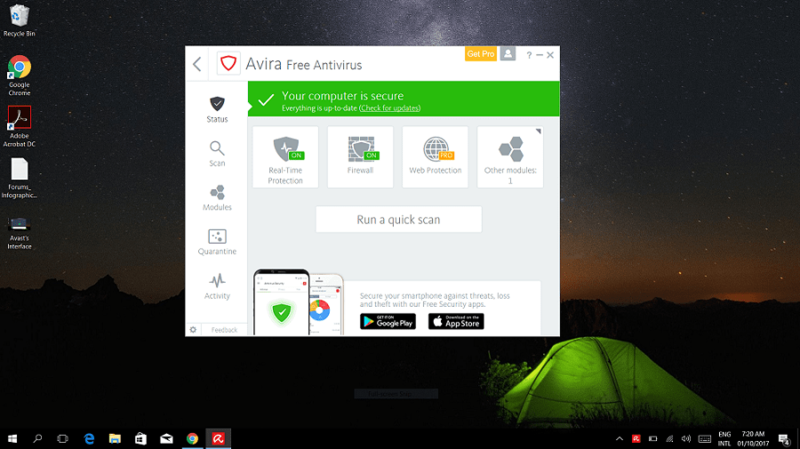 Avira or Avast, which antivirus software is a better option in 2019? Read this data-driven Avira versus Avast comparison to make a smart decision. In this ultimate guide, you’ll see what’s included in different security products both Avira and Avast offer, as well as how both software compare in terms of malware protection, impact on system performance, user interface, cost, and more. In today’s world, you need to be extra vigilant about protecting your devices against various kinds of malware threats (such as viruses, Trojans, rootkits, spyware) because — needless to say — hackers have gotten a lot smarter with time and are constantly in search of new ways to sneak into your computer. Once malware-infected programs get into your computer, they can do a lot of terrible things; they can steal your sensitive data, cause your computer to crash or slow down, delete your personal data or photographs, corrupt your favorite software, and more. Before delving into details, let’s look at the different security suites Avira and Avast offer. If you want the answer straight away, see the graphic below and also read our short verdict before making a decision. Avast is better than Avira as it not only offers more security-related features and extra utilities in its security suites but also provides excellent protection against all sorts of malware threats. However, Avira is slightly ahead of Avast when it comes to putting an impact on system performance. Avira vs Avast: Which Offers More Features? Avira and Avast both offer different security solutions for Windows and MacOS. First, let’s see what features are included in the Windows-only antivirus suites that both companies offer. Both Avira Free Security Suite and Avast Free Antivirus include essential security-related features along with several handy utility tools that are just as useful. 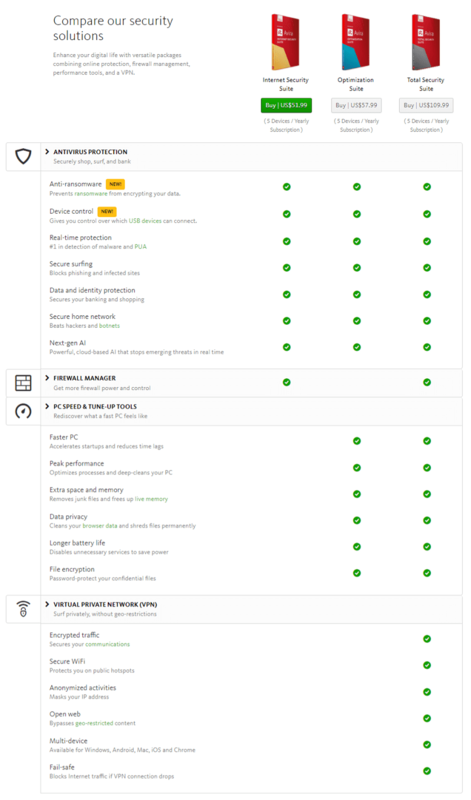 But it must be said that Avast has gone a step or two further by adding several extra tools in its freeware, such as a Wi-Fi inspector (checks for security issues in your home network), a silent/gaming mode feature, a browser clean-up option, and email client protection. Both free solutions include a bootable rescue disk option (helps remove deep malicious infections), a password manager, and a software updater. Both freeware also offer a limited free VPN to protect your online privacy; Avast offers a free 30-day trial of its SecureLine VPN, while Avira’s Phantom VPN gives you a free data volume of 500 MB every month. A limited system optimizer/cleanup tool is also part of both free software. Avira offers two browser extensions: SafeSearch Plus and Safe Shopping. The former is a search engine that lets you surf the web while filtering out unsafe, dangerous websites, while the latter shows you the best deals from around the web, blocks annoying ads, and also provides protection against fraudulent websites. The two extensions Avast offers are Online Security (protects you phishing attacks and blocks fake websites) and SafePrice, which helps you find the best deals and coupons while you shop online. Now, let’s talk about what you’ll get in terms of features if you opt for a premium plan. With Avira Antivirus Pro, you’ll get everything in the free plan plus email & network protection, data & identity protection, ransomware protection (prevents ransomware from encrypting your files), a Device Control option (scans devices connected to your USB ports for malware), a secure shopping/banking experience, and premium customer support. Another useful feature you’ll find in the ‘Pro’ plan is Firewall Control. It makes sure your built-in Microsoft’s firewall remains active all the time. The next level up is Avira Internet Security. It adds an advanced firewall manager, which helps you make the most of the Window’s firewall. Avira Optimization Suite adds several PC tune-up and optimization tools (but doesn’t include a firewall for some reason), along with every feature that comes as part of the “internet security” plan, while the fully-fledged Avira Total Security takes things to another level by including all the features of the previous two suites and further adding a VPN. Note: All of the above security suites are Windows-only, except the Avira Antivirus Pro, which works on MacOS too. Now, let’s see what Avast offers in its premium suites. 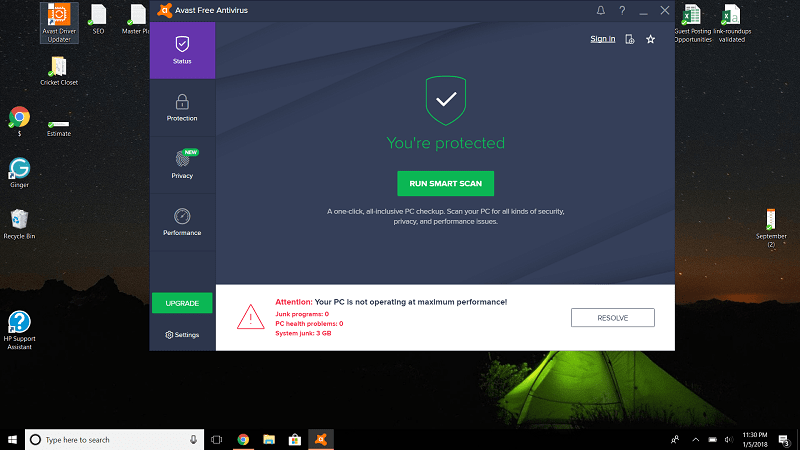 Avast Pro Antivirus includes everything in the free plan plus Sandbox (enables you to run suspicious files in an environment separate from your computer), a Real Site feature (prevents hackers from stealing your data using DNS and secures online shopping/banking), and premium in-product support. Avast’s Internet Security suite adds an advanced firewall and an extra layer of ransomware protection, along with everything that’s jammed into the “pro” suite. Another level up is Avast Premier. It adds a data shredder (helps you safely delete your sensitive files for good), protects against webcam spying, and automatically updates other outdated software programs. With Avast Ultimate, you get everything in the ‘Premier’ plan plus a cleanup utility and a VPN. Now, let’s talk about what Avira and Avast offer for MacOS. Avira’s Free Antivirus for Mac delivers “first-rate protection for free.” It provides a great level of protection against all kinds of online threats, including viruses, rootkits, spyware, and adware, but doesn’t offer a lot of extra utility tools like its free Windows counterpart. Out of all the security suites Avira offers for Windows, only Avira Antivirus Pro is compatible with MacOS. Avast offers two separate security solutions for Mac: Avast Security and Avast Security Pro. 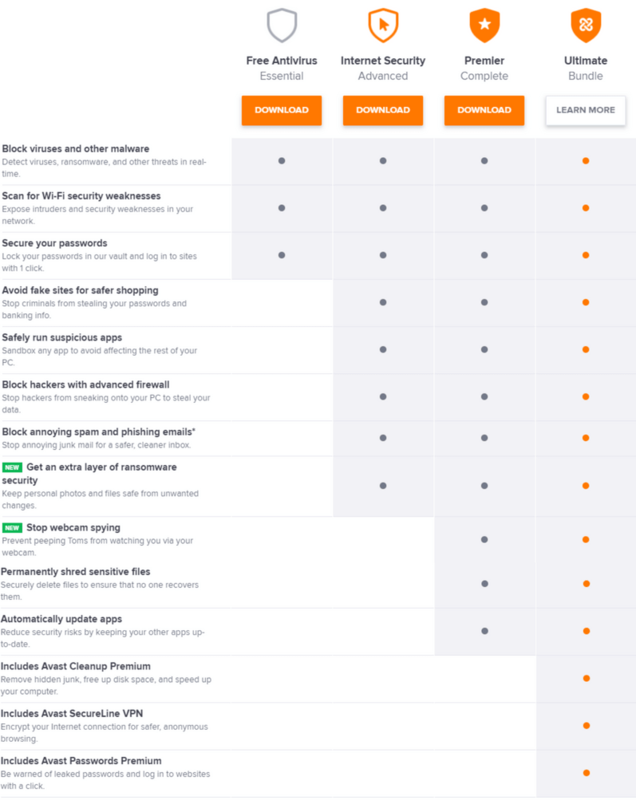 Much like Avast Free Antivirus, Avast Security is freeware for MacOS that boasts great anti-malware capabilities, warns you of unsafe websites, and blocks dangerous email attachments. It also includes a home-network scanner to help you find vulnerabilities in your network and stop hackers from stealing your personal data. Avast Security Pro includes all the features of its younger sibling, along with top-notch protection against WiFi intruders and ransomware. Overall, it can be said that Avast provides more features and utilities in its security suites than Avira. Avira vs Avast: Which Software Provides Better Protection? Both Avira and Avast are excellent at identifying and crushing malware and use more or less the same signature-matching detection and heuristic monitoring technology to detect all sorts of known and unknown malware threats. To see which of the two software provides better protection, I’ll look at the most recent tests conducted by the AV-Test, Germany’s well-known IT security institute, and AV-Comparatives. In the AV-Test’s most recent tests, which were held in November and December last year on Windows 10 platform, their experts tested various antivirus products against 185 samples of zero-day malware and 10,684 samples of widespread malware. 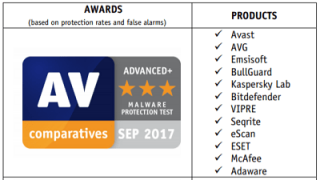 Avast received a perfect 6/6 star rating; it blocked 100% of the zero-day malware in both months, and 99.9% of the widespread malware in November and 100% in December. On the other hand, Avira was slightly less effective; it protected against 97.9% of the zero-day malware in November and 100% in December. Against widespread malware, its detection rate was 100% and 99.9% in November and December respectively. It received a slightly lower but impressive 5.5/6 star rating. courtesy its near-perfect 99.99% protection rate. Also, it only returned 9 false positives (i.e. misidentifying harmless file/application as a malware) during the test. 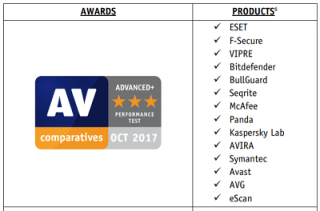 In the AV-Comparatives’ “real-world protection test,” which took place in November last year, Avira and Avast both received the “ADVANCED +” award due to their superb protection rates of 99.7% and 99.6% and low wrongly blocked scores of 9 and 11, respectively. As the results suggest, Avast is slightly ahead of Avira when it comes to protecting against malware threats. Avira vs Avast: Which Software Uses Less System Resources? To provide real-time protection against malware threats, antivirus programs have to continuously run in the background, which means they consume some percentage of system resources all the time. Both Avira and Avast are extremely lightweight software and account for minimal system resources. In the AV-Test’s most recent performance tests, they checked the influence of different antivirus products on system performance by carrying out typical tasks, such as visiting popular websites, downloading/installing few commonly used applications, and copying of files. Here’s how much impact Avira had on a standard and on a high-end computer, expressed in terms of a percentage slowdown. It received a perfect 6/6 star rating from the experts at AV-Test in the ‘performance’ category. Here’re the results of the same study when done with Avast installed. Avast received a slightly lower 5.5/6 star rating. carrying out the following tasks: file copying, archiving/unarchiving, installing and removing applications, launching applications, downloading files, and browsing different websites. Avira’s impact score was 8.5, slightly better than Avast who scored 8.7. However, both software came out of the study with “ADVANCED +” awards. So, Avira is the winner in this category, but Avast is pretty close too. Needless to say, neither of them will greatly slow down your computer, even if your hardware is a bit behind the times. Avira vs Avast: Which Offers Cleaner User Interface? An attractive visual appearance and a clean navigation is something everyone loves, and both Avira and Avira won’t disappoint you if that is what you prefer, too. Avast’s modern-style dark interface sits nicely on just about any operating system. It has a vertical menu on the left that comprises the following tabs – Status, Protection, Privacy, and Performance. Each tab contains relevant features and their settings. At the bottom, there is an unobtrusive banner that asks you to upgrade for added protection and features. The green color shows that everything is fine and no further action is needed on your part while the red signals a problem. Avira, which used to be slightly outdated in the past, has significantly revamped its interface, but I — and I’m sure most users will — still find it a bit overwhelming. Its interface looks like a typical Windows application, with five tabs (Status, Scan, Modules, Quarantine, and Activity) on the left that are arranged in a vertical menu. You can access settings using the button that is placed at the bottom left. From the Avira Connect dashboard, you can access any tool with just one click. The color scheme is bright, with the green color representing that everything is okay and the red signaling an issue. So, Avast’s user interface is simpler and cleaner than Avira’s. Avira vs Avast: Which will cost you more? Note: With Avira, you can protect as many as 5 devices with a single subscription. Avira vs Avast: Which Is The Most Popular Solution? To find out which of the two products is more popular is not an easy task. Both Avira and Avast claim that their product is the most downloaded free antivirus solution on the internet. However, if you take a deep look, you’ll see that one is clearly ahead of the other. OPSWAT, which releases monthly reports on the market share captured by different antivirus companies, says in its latest report that Avast is leading the overall market with 19.11%, followed by ESET (14.49%) and McAfee (9.57%). Avira is fifth on the list with only 7.32 percent market share. On CNET’s download.com, which is the World’s most popular software download portal, Avast has more overall downloads than Avira. Also, Avast also boasts a bigger social media following; it has over 4 million Facebook fans and 181k Twitter followers, while Avira has just over 1.5 million fans on Facebook and 19k followers on Twitter. The digital world has become increasingly complex, and it makes sense to say that you should invest in a reliable antivirus product to stay protected at all times. Avast full scan was unable to detect some viruses on my computer while the Panda cloud cleaner free scan detected and removed all the viruses which were left by Avast. Avast’s virus detection and removal capability is not 100 %. Similar is the case with Avira and Kaspersky. No antivirus is 100 % accurate. Avira and Kaspersky’s detection rate is 98% while that of Avast is 92 %. Avast capability of blocking viruses from internet is very poor. These are my personal experience with many antivirus programmes. Kaspersky’s blocking internet malware is the best, followed by avira. Thanks for your input, Ejaz. In 2019, we believe that there is no better option (for both PCs and Macs) than Bitdefender. It performed exceptionally well in all the independent lab tests we considered.